Product #1224 | SKU EF5012LUSM | 5.0 (based on 3 ratings) Thanks for your rating! The EF 50mm f/1.2L USM Lens from Canon is a fast prime lens featuring a particularly large maximum aperture for effective low-light and shallow depth of field capability. As a standard focal length lens, it is suitable for most any shooting situation and its lens coating and optical construction are optimised to minimise chromatic aberrations, ghosting and flare. A truly circular diaphragm results in pleasing out-of-focus areas. Our most popular rental lens for weddings, fashion, events and HD video . 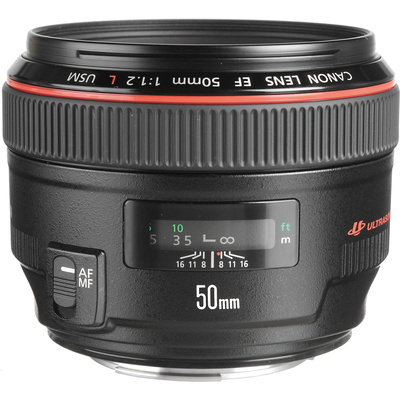 Fastest 50mm canon lens, with good glass, this is a must have in your lens kit if your into photography or videography! !